What is CV (Cyclic Voltammetry) Measurement? Our electrodes used for electrochemical measurements such as CV, LSV , DPV and so on are compact and easy enough to be polished by yourself. Remove the cap covering the electrode, and check its surface prior to the first use. Carbon paste electrode is available in the form of carbon paste which user packs into a shallow well in the electrode holder supplied by us. Other electrodes are polished to immediate use. These electrodes are encapsulated in PEEK* - solid, well inert against solvent. 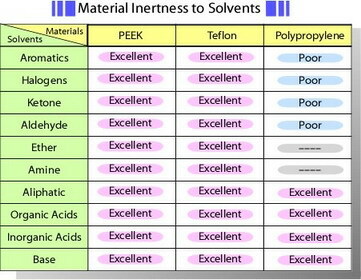 Table of material inertness to solvents is shown below. However, long-term immersion in tetrahydrofuran or using under higher temperature which exceeds the temperature coefficient between plastic and electrode material might be a cause of crack. O-ring enables a position of an electrode to be adjusted in the voltammetry cell. Akira Fujishima, Toru Inoue, Method of Electrochemical measurement, Gihodo Publishers, 1984. The figure below shows the appropriate materials of the electrodes to research at some potential range. 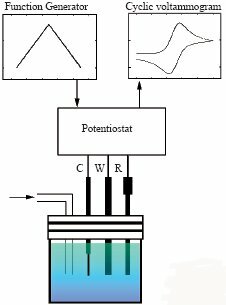 To analyze the redox activity of a substance dissolved in a kind of aqueous electrolyte with certain pH, it is indispensable to consider about hydrogen over of the electrode, oxygen over voltage and dissolution potential. 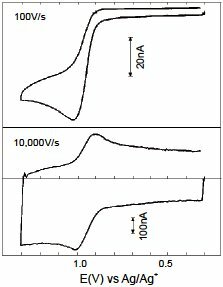 Linear Sweep Voltammetry (LSV) measures the electric response with sampling it at a constant scan rate from initial to final electric potential. Choice of working electrode is a vital component for experiment. Redox potential of molecule under research have to fall in the potential window over which the background current due to the electrode itself must not disturb the experiment. 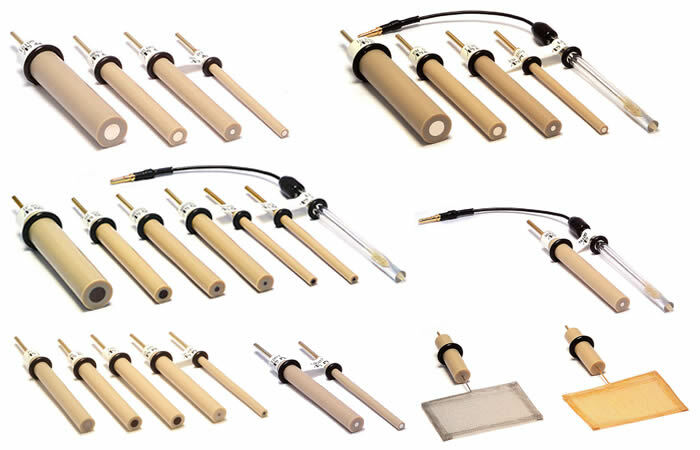 Pt (Platinum) and Au (Gold) electrodes - applied to organic or inorganic substances measurement because they have high overpotential for oxygen evolution and low overpotential for hydrogen evolution. Hg (Mercury) electrode - well suited to measure reduction of metal ions because of its high overpotential for hydrogen evolution. Hg electrode can easily observe the reduction of Zn. At the measurement with non-aqueous solvent, hydrogen/oxygen overpotential does not affect. Instead of that, decomposition potential of the non-aqueous solvent and supporting electrolyte comes to an important factor. 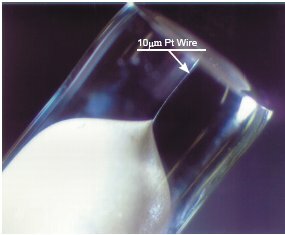 Furthermore, impurity of water in non-aqueous solvent makes the potential window narrower depending on the quantity of the water. 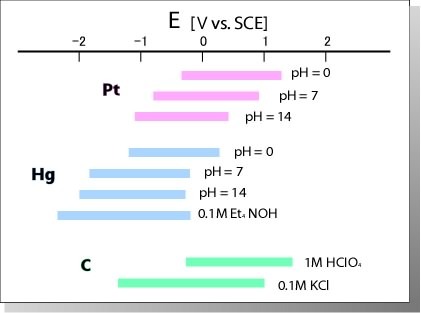 Figure: Current-Potential curbs of the result of 50 times scanning by immersing a Pt electrode in 0.5 M H2SO4 solution. Reiteration of the cycle obviously activates the electrode. 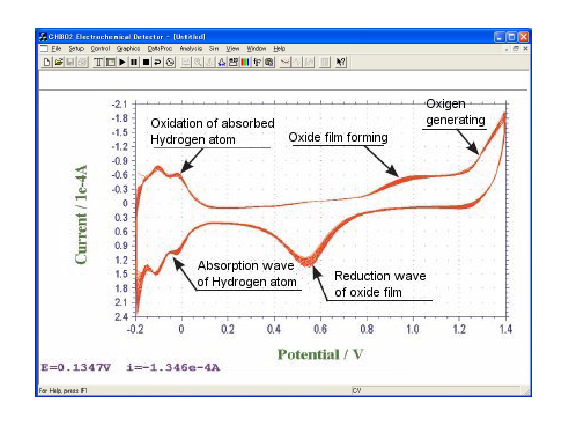 Although there is absorption wave at the cathode side, it is possible to observe other reaction of the electrodes in this potential range because this reaction requires only certain quantity of electricity.